Mushrooms, the fruit of fungi that lives in soil every continue to fascinate people. Whether it’s identifying the mushrooms like the inky cap, that tend to pop up in the yard from time to time, or for picking the cream of the crop wild mushrooms to try out in a new recipe, questions about the types of mushrooms growing wild continue to be popular. Any mushroom identification guide necessarily starts with a precaution. Many wild mushrooms are toxic and consuming wild mushroom pose potentially severe medical problems. The old adage, when in doubt throw it out, applies to mushroom hunters. A beginner’s guide to mushrooms often starts by dividing most of the common mushrooms into those that have gills under the cap and those that have pores under the cap. Common edible mushrooms such as the king bolete, are listed in the pores category. The following picture presentation provides a quick review of some common gilled mushrooms, along with a group of additional mushrooms. 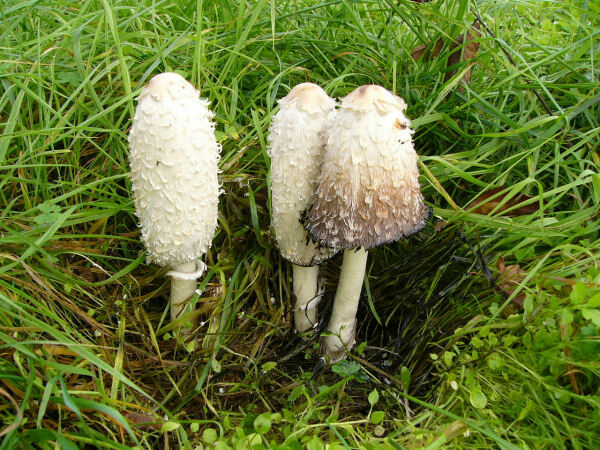 Questions about the types of mushrooms commonly found growing in the lawn also get asked frequently. No one wants their pets or the small children accidentally eating a poisonous mushroom. Fortunately most of the common lawn mushrooms cause no harm to animals or children. Most are gilled mushrooms, although depending on the landscaping, bolete mushrooms can easily pop up in the lawn if there is a host tree or shrub. Check out the shelf mushrooms section to determine the severity of the problem of finding a shelf mushroom on any tree in the yard. Restricting the types of mushrooms to some basic pore, gilled or shelf mushroom categories does leave a big hole in the mushroom world. Common names such as puffballs, stink horns and jelly mushrooms all fit into the general mushroom category. They are a fun group of mushrooms to look for while hiking. Fall hiking, for example, brings out what many might call halloween mushrooms. 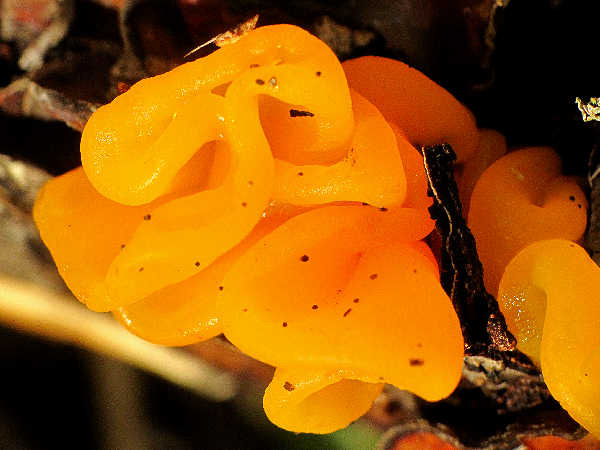 The picture at the top of the page for example, shows a jelly fungus that commonly goes by the name Witches Butter. They look like small blogs of orange or yellow jelly that pop up on tree branches. Jelly mushrooms are abundant in many wooded areas of the United States. The Apricot Jelly is fairly common along the West Coast and the Great Lakes area. It might even look like a tongue growing out of the ground with its pink to salmon color. A couple of mushroom species go by the common name Elfin’s Saddle. Note the funky looking stem and cap. 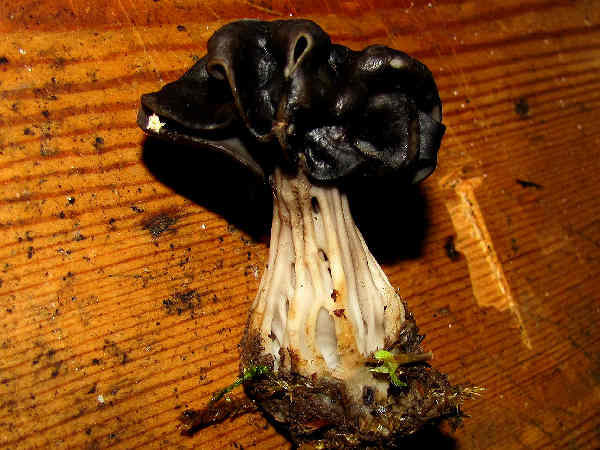 This particular species goes by the name slate grey saddle or fluted black elfin saddle. They are common in both the East and West coast wooded areas, including neighborhoods with tree lines streets. 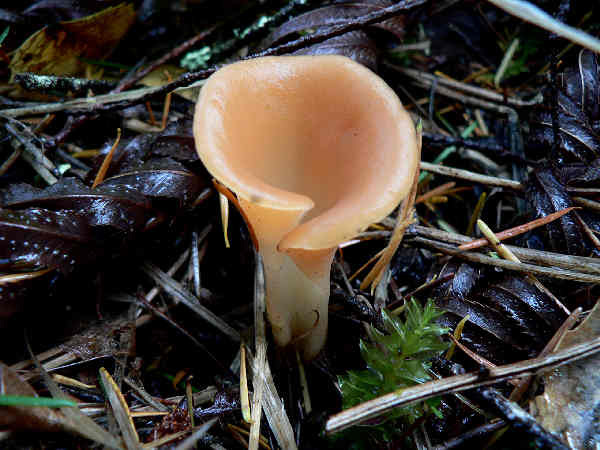 It’s also a great Halloween Mushroom that can be found during the fall season. For those mushroom enthusiasts a tad bit scared of Witches Butter, they can hop on the nearest Elfin Saddle and fly away. Dried mushrooms are the second best thing to fresh mushrooms. Whether found in fields and forests, or purchased at a local market, most mushrooms have a limited shelf life. Drying mushrooms extends their shelf life. Of course, not all types of mushrooms are created equal for drying, with many experts recommending morels and some bolete species as the prime candidates for preservation by drying. They are among the few mushroom genera that retain their flavor and texture when dried and reconstituted. 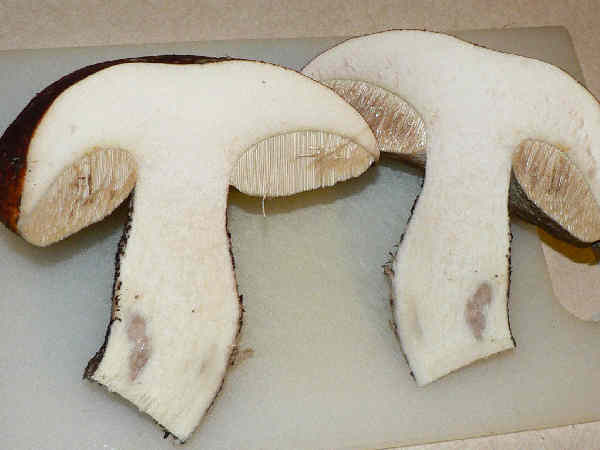 The picture shows a bolete mushroom cut in half with the pores removed. The flesh is white except for a bruise on the lower part of the stem. If the mushroom has worm holes and decaying flesh the mushroom is well past its prime. Mycologists generally warn against eating any blue staining bolete species. A field check for bluing is easy and is accomplished by ruing a thin object across the pores. Breaking off a piece of the cap also promotes bluing. The picture also brings to mind the old truism, buyer beware. Purchasing wild mushrooms from local vendors carries risks. Requesting vendors cut fresh mushrooms in half prior to purchase is a generally accepted practice at farmer’s markets. With mushrooms in hand, the actual drying process begins with preparing the mushroom. Preparation initially involves cleaning the mushrooms. Using a clean cloth to remove excess dirt, and where applicable pores, from the mushroom usually completes the cleaning process. Mushrooms tend to absorb water, so experts recommend against soaking them in water for cleaning purposes. After the mushrooms are cleaned they can be sliced to a uniform size, often about an inch in length, and placed on the trays of a conventional dehydrator. Set the dehydrator at a low temperature, no higher than 120o, for approximately six hours. Higher drying temperatures tend to cook rather than merely dry mushrooms. When the mushroom pieces completely dry, they look leathery. Placed in an air tight container, expect the dried mushrooms to have two year shelf life two year shelf life.